A commitment session in London with a couple of incredible complicity. Camilla is Italian, studying in London and preparing a law degree. Paolo is from London. He’s Italian too. They met years ago because Camilla was on holiday with Paolo’s parents in London. Paolo admits to having hit on her for years every summer when she came on vacation without success, poor thing. Then one day she finally said yes. Our couple live in North London, Hampstead, Golders Green, Cricklewood, Primerose Hill are their quarters. 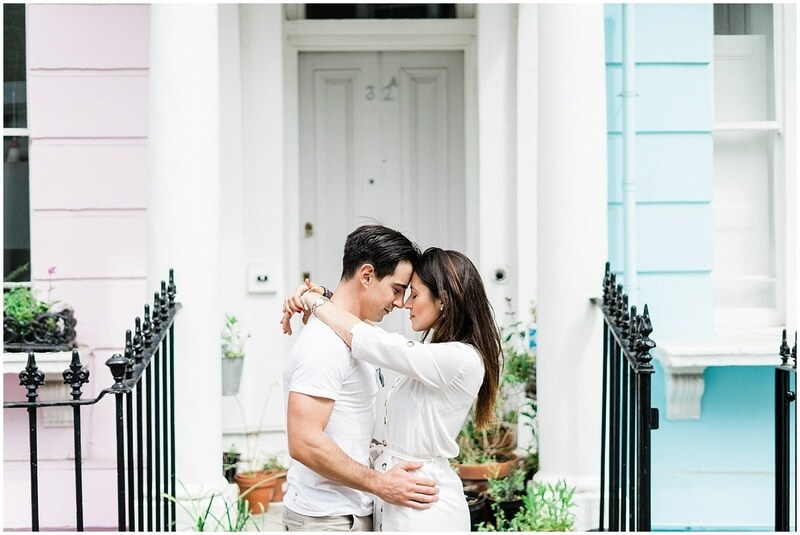 The engagement session began with a session with Camilla as Paolo was working, and the next day they chose the Primerose hill area with its bourgeois and colourful houses. London is a resourceful city where I love to shoot, and this area is one of the treasures to discover. “Paolo and I met each other for the first time in 2010. I was only 16 years old (Paolo was 23) and I went to London to learn English: I ended up staying in Paolo’s mum place, since she is a host mother. Paolo and I suddenly became very good friends and we could feel there was a strong connection between us. I also became friend with Paolo’s parents and that’s why I used to go often to London to visit them. In the meanwhile Paolo and I had our love stories, lived our lives and walked in different directions. Four years later we decided to go on holiday together,just the two of us, in Sri Lanka. In that moment we realised that between us there was really something more. I was scared by the distance (since I was studying law in Milan) and I was constantly saying no to Paolo’s request to give it a try.